Why Choose RFCE? - RFCE - Resources for Continuing Education, Inc.
Home > Why Choose RFCE? Resources For Continuing Education, Inc. is certified and/or vendorized to educate administrators of residential care facilities for the elderly (RCFEs), adult residential care facilities (ARFs), and nursing home administrators (NHAP) as well as RNs and LVNs. The company holds certifications from the Department of Social Services (Community Care Licensing), the Board of Registered Nurses, and the Department of Public Health Services. Resources For Continuing Education, Inc. or RFCE, has been owned and operated by Michael S. Goryan, MA, since 2000. 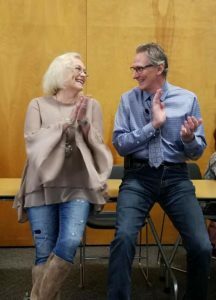 He is joined by his wife, Robin Ziegler-Goryan, a certified and active elder care administrator, in teaching continuing education units (CEUs) and initial certification courses. Although located in North County San Diego, the education courses are taught throughout Los Angeles, Orange, Riverside, San Bernardino and San Diego Counties. Depending on time and location, class attendance averages 30-35 students for CEUs, with the initial elder care courses averaging 20 students. The courses are purposely affordable to draw students into active participation as Mike, a former DJ, makes students laugh while learning. Robin attracts students with her abiding respect and admiration for care providers. Mike’s experience and knowledge of the laws is unique and unsurpassed. His approach enlightens and empowers students, and Robin has a practical application and a simplified approach to residential care and facility management. Both Mike and Robin have represented clients at state licensing offices and in legal proceedings, with many dismissals associated with their arguments of the law and the regulations of the state. Call Mike and Robin and discuss with them what your needs or dreams are about caring for the most vulnerable and often neglected people. We’re always there to help.